FlyerTalker Lending Team on Kiva.org! improving lives a small loan at a time. 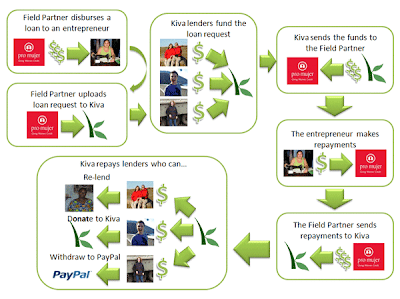 Kiva.org is the not-for-profit microlending organization that networks people willing to lend to small entrepreneurs in developing nations using available technology and international networking / collaboration, and how Kiva.org had become an approved FlyerTalk charity thanks to TalkBoard's approval June 29, 2008 <link> It is listed on the FlyerTalk Cares page. As of 15 May 2016 it's 607 FlyerTalk lending team who have lent $2,209,175 in 37,092 loans! Our motto is: "We loan because: We want to fight global poverty while earning miles." Now, we can see this sophisticated network link resources from those who can lend (no interest, sorry!) with those who are needy, worthy and screened by local NGOs and have a need to start / expand their small business to enhance their and their families' survival. And, using PayPal and your FFP/FFG linked card or account, you can earn miles or points with many loans! FlyerTalkers are lending, and fulfilling one of FT's seminal values, that of "paying it forward." Add your experiences here, or if you haven't joined... won't you consider joining the FlyerTalker Lending Team? I challenge every member of this site to make one loan this month. You know you want the free miles. Use a miles-earning credit card and help support entrepreneurship. Your loan will be repaid by the borrower and you pocket the miles. Everybody wins. As of 4/13 we are at 903 loans between 122 members. Is it to much to ask our community to increase the loans to 1000 by April 30th? Closing in on $30,000 total as well. I will definitely add a few loans when repayments come in in a few days. We should hit 1,000 loans/$30,000 easily. 2 of us from FT have supported this loan: Joyeux Lutins Plus Group . $2750 still needed so join the FT team on this loan. I just added 4 more loans, including 1 to Joyeux Lutins Plus Group. FlyerTalk is now the #1 team lending to this group. Keep it up! Their fundraising has been a little slow. If you want to make a loan try adding to other FT'er loans. Look for "Raising Funds"
Could FT fully fund 1 loan ? after a recent visit to Ukraine I was really impressed with the way some of the people I've met are "surviving" in an area with no jobs and little enterprise happening thanks to ineffective government. $25 is all you need to start. Thats only a few beers or coffees. OK, I'm in. Just made my first loan as a member of the Flyertalk team! I have some very exciting news! Looks like FlyerTalk will have their very first Kiva Fellow. I've been told that I will be (tentatively) placed in the East Asia & Pacific region for a minimum of 12 weeks, but don't have any more info than that yet. I can't tell you how excited (and nervous) I am! p.s. We are at $29,400, almost to $30k!